Alsa clearcoat products provide uniform high shine appearance and retain shine for many years to come. There are many advantages of clear coats. By using clear coats the manufacturers are able to create more specialized colors. look at some of the nice colors on the cars today. This is made possible by the use of clear coats and techniques that can be utilized. Some of today's clearcoat paint finishes are the most durable ever applied to automobiles. This is true not only of factory finishes, but also in the aftermarket. Proof of the durability of clear coats over single stage paint finishes is evidenced by the warranties that auto manufacturers are offering on the clearcoat paint finishes. Durability is really a very real concern for car owners today. With the increase in pollution and other environmental factors, a car's finish is subject to serious damage. Acid rain; jet fuel fallout; industrial fallout; hard water, not to mention high acidic bird droppings; insect residue; tree sap all are very dangerous to a paint finish if not removed immediately. Clearcoats make repairs and maintenance much easier. A repair can be made on a portion of the panel and the color coat blended in that area, then the entire panel is clear coated. This will eliminate the problem of panel to panel color mismatches. As detailers you know that clear coats do create some problems of their own for you, but in general the clearcoat has really helped to reduce the amount of time we have to spend on the paint finish. Even a clearcoat with scratches or water spots that has to be buffed is much easier to work on than an oxidized metallic single stage paint finish. While most car manufacturers won't admit it, the cost of applying clearcoat/basecoat finishes substantially reduces their cost to paint the car. 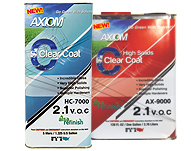 Axiom Clearcoats for overall vehicle refinishing. 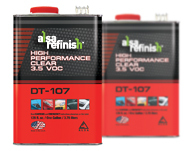 HC-7000 is one of our top-of-the-line clearcoats designed for overall vehicle refinishing. This clear has a slow dry time, allowing a perfect leveling for a finish that is next-to-none! Furthermore we introduce a specialized reducer specific but not limited to the HC-7000 Clear, designed for the reduction of 5% by volume in order to make the clear more production friendly. The AX-6000 Reducer and the HC-7000 Clear combined can be polished in 4-5 hours. Crystal Clear - Urethane clearcoat for a great gloss. Crystal Clear is a great overall or spot repair Urethane clearcoat providing a great gloss over on all basecoats. 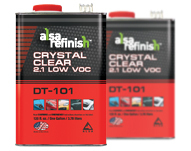 DT-101 is a medium solids 2.1 VOC clearcoat with excellent leveling and is very easy to sand and polish even weeks after it has been applied. Crystal Clear can be force-dried or allowed to air-dry. The dry times will be determined by the choice of hardener; fast, medium or slow. DT-107is an impressive overall or spot repair urethane clearcoat with a VOC of 3.5 LBS/Gal designed to give a factory finish-look with a minimal amount of orange pearl that match the GM, Ford and Toyota Orange peal Spec. The Dry time of the DT-107 will be affected by your choice of hardener; fast, medium or slow. High Velocity car Clearcoat - polished in 45 minutes! 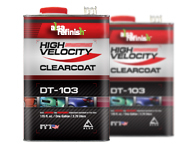 DT-103 is a spot and panel urethane clearcoat with a voc of 2.1lbs/gal. High Velocity can be polished in 45 minutes giving you extreme dry-times needed in a production or mobile environment. The dry-time of the DT-103 will be affected by your choice of hardener; fast, medium or slow. Production Clear - universal hardener Formula 77 for car spot repair. 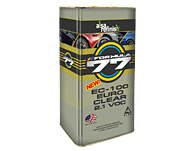 Formula 77 product range is great for spot repair and overall vehicle refinishing. We offer a universal hardener that works equally well on primers and clearcoats. 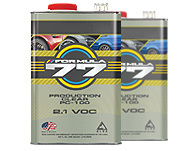 Compare Formula 77 to your favorite brand and you'll find top quality at a fraction of the cost. Euro Clear 2.1 VOC - urethane primers and clears.